I like the color choice. Will be doing mine in a similar color when get doing one. That looks great. Outstanding work as always. 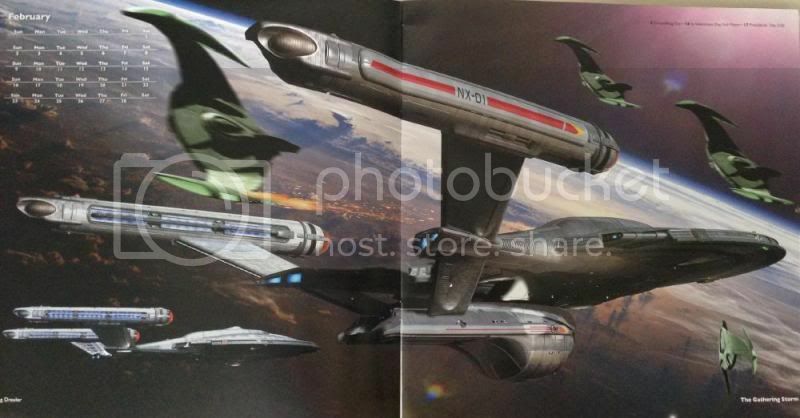 If you happen to have the 2014 Ships Of The Line calendar you'll see that the refit is actually painted in TOS colors so you're following DeSalle's revision of the ship exactly. I'm working on this ship myself right now. I chose to color it the usual metallic first and then do the TOS coloring over it so it would be in line with what would've happened in the drydock at the shipyards during the refit. I like the idea of metallic with light paint over it. 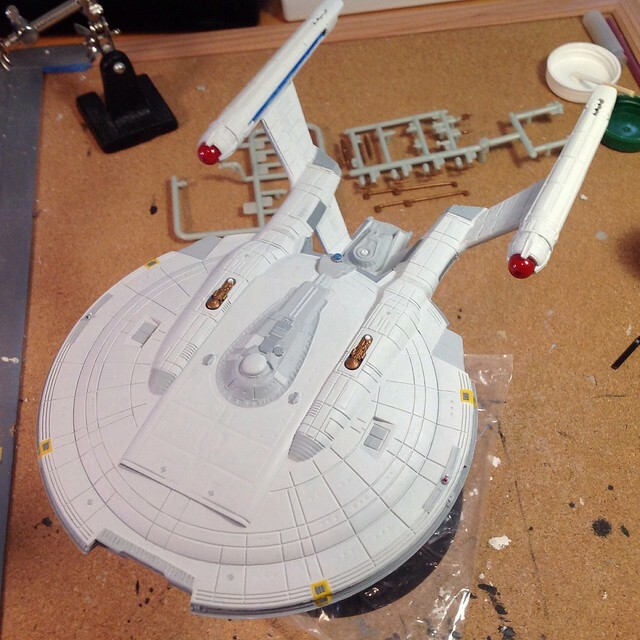 Would that be just a thin layer or some kind of translucent paint? Me, I'm sticking with my grey enamels. 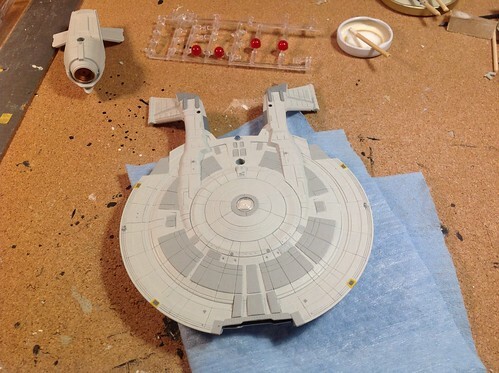 After days without touching the model, today I managed to add some detail to the saucer's underside. I notice that the clear sensor dome has two cracks in it. Clear parts are so fragile. 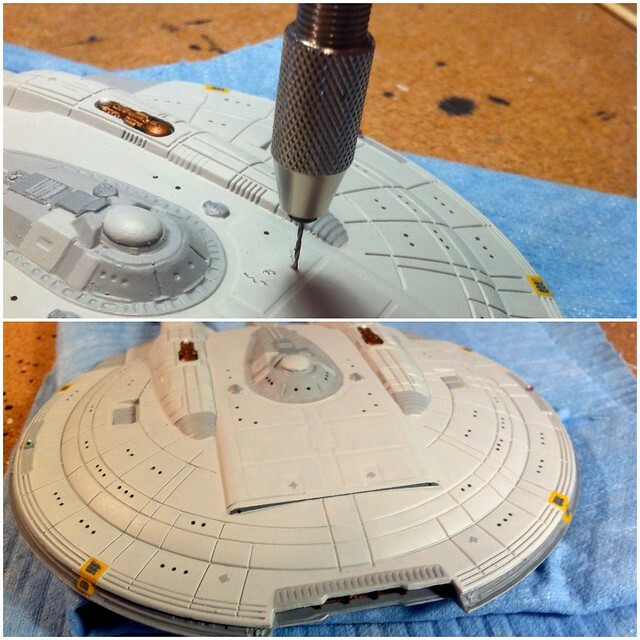 I'm trying to hide the cracks with a white semi-translucent paint. Dry-fitting the parts before final assembly. I still have more detail to paint as well as the decals, but everything is coming together nicely. Using a pin vice, I half-drilled each of the windows. Instead of ill-defined dents in the hull, now I have perfectly round portholes that I can paint later with a warm white paint (or a dark colour for unlit windows). The TOS colors look really good on it! I concur with El Gato. I am jealous of your skills! Plus this looks outstanding. Great work.